When a few internationally-known singers and Hollywood film stars began collecting the ‘quirky’ shapes and colourful patterns of Clarice Cliff pottery in the 1960s and early 1970s, small pockets of collectors with an eye for the eclectic began buying this unique British pottery in America, Canada, South Africa, Australia and New Zealand as well as in the UK. Very little, if anything, was known at the time about Clarice Cliff or her pottery. Yet in 1971 the Minneapolis Institute of Arts acknowledged her as a major Art Deco designer when a large number of her pieces appeared in their influential “World of Art Deco” Exhibition. In Britain the Brighton Museum held a Clarice Cliff retrospective exhibition in 1972 to which she contributed notes for the catalogue and some pieces from her own collection, later giving them to the museum. She did not tell anyone about this event until after it was over, nor did she attend. In 1976 Noel Tovey of L’Odeon mounted a major exhibition of her work at his London gallery, where the first book “Clarice Cliff” by Peter Wentworth-Sheilds and Kay Johnson was launched. In 1977 Leonard Griffin discovered Clarice Cliff pottery at a local Nottinghamshire antiques fair, and felt so inspired he had to find out more. His extensive research in the Staffordshire Potteries led him to trace over twenty-five of Clarice’s paintresses, fondly known as the “Bizarre Girls”. 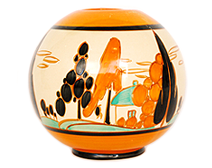 It was their recollections with hitherto unknown information on the shapes and designs Clarice produced which prompted him to establish the Clarice Cliff Collectors Club in 1982 with just 34 members, producing regular informative Review publications. 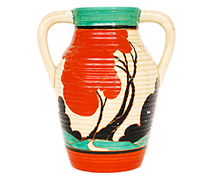 On 29th June 1983 Christie’s, the world famous auctioneers, held their first ALL CLARICE sale - ‘Bizarre Pottery by Clarice Cliff’ – the Property of a European Collector - at their Great Rooms in King Street, St. James’s, London SW1 (165 lots). Throughout the 1980’s more and more collectors joined the CCCC which served the enthusiastic collector and those with an academic interest alike. By 1988 Leonard had amassed so much information that with American collectors Louis and Susan Meisel he produced what became the ‘definitive book’ - large in size and lavishly illustrated - entitled ‘Clarice Cliff: The Bizarre Affair’. This publication had the most profound effect on Clarice Cliff collecting; the antiques trade, particularly in Britain, at once recognised the new importance of Clarice Cliff. This intense interest led to CCCC conventions in Britain, a series for many years of Christie’s bi-annual ALL Clarice Cliff auctions, and several exhibitions. In 1995 Leonard was consultant and writer for ‘The Rich Designs of Clarice Cliff’ and was invited to produce a book on Clarice’s Teapots – ‘Taking Tea with Clarice Cliff’ the following year. This attracted thousands of new enthusiasts to Clarice’s Bizarre pottery selling two hardback editions. Demand for yet another Clarice Cliff book was so great he wrote ‘The Fantastic Flowers of Clarice Cliff’ in 1998. By this time Wedgwood owned the Clarice Cliff name, and for Clarice’s 1999 centenary year, they planned an exhibition celebrating her achievements. Leonard was the official consultant, and it was through the generosity of many CCCC members that over 600 pieces were assembled and displayed at the Wedgwood Museum in Barlaston, Stoke-on-Trent. His centenary year book ‘Clarice Cliff: The Art of Bizarre’ linked to the exhibition and many exceptional pieces from it. The whole Clarice Cliff story was up-dated with a mass of newly discovered information, and it was one of the most comprehensive works ever published on the Potteries first ever female Art Director and pottery designer who had brought a new and powerful art concept – ‘Bizarre ware’ - to the public’s attention in the 1930’s. The CCCC entered the computer age as claricecliff.com the brainchild of fellow collector and co-owner Andrew Hutton. Throughout the club’s 31-year history we are still discovering ‘new’ patterns; Clarice continues to surprise us with her extensive range of abstract, geometric, landscape and floral designs. In 2012 the world’s leading Clarice Cliff dealer Birmingham-based Andrew Muir, along with Fieldings Auctioneers Ltd co-owner and auctioneer/BBC Antiques Roadshow consultant Will Farmer became the new owners of the CCCC. Both are long-term collectors of Clarice’s Bizarre ware, with Will some years ago becoming our youngest-ever club member aged just 13! 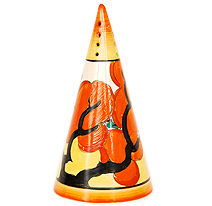 For the past year they have been planning this extensive new internet site – ClariceCliff.com - and again are achieving another ‘Clarice first’ by producing the world’s largest on-line museum of Clarice Cliff pottery. We can all certainly take part in that! If you would like to be a part of ClariceCliff.com, sign up and become a member.